Brad Keselowski held off Darrell Wallace Jr. late in Thursday’s rain-postponed Camping World Truck race at Bristol Motor Speedway to get his first victory ever in the series. The victory came in his third start in the series in 2014 and his 62 career start. It made him the 25th driver to win in each of NASCAR’s top-three national series. Wallace, who had moved to Keselowski’s rear bumper with two laps to go, finished second. The finish gave Wallace his fifth podium finish of the season. Ron Hornaday Jr. finished third and Matt Craftsman, who leaves Bristol second in points (eight behind Sauter) was fourth. Johnny Sauter was fifth and kept his points lead. Kyle Busch, who started from the pole, led the first 12 laps before being passed by Keselowski. The two Sprint Cup regulars traded the lead a couple of times before Busch, on Lap 88, took the lead and held it until Lap 124. On that lap, Busch made a rare mistake by slipping high out of the groove. 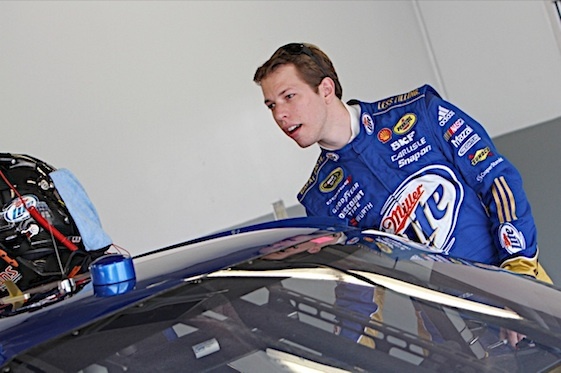 That allowed Keselowski to retake the lead. Busch closed on Keselowski and took the lead just before a caution flag waved on Lap 145. On the restart, Keselowski jumped out first from the top lane. A couple laps later, Wallace moved past Busch and into second place. From there, Wallace tracked down Keselowski. With 35 laps to go, Wallace moved to Keselowski’s rear bumper. With 25 laps to go, Busch joined the fight for the lead from his third-place spot. But a lap later, Wallace and teammate Wallace both clipped the wall. Busch cut a tire and had to pit while Wallace lost touch with Keselowski’s bumper. From there, Keselowski pulled away before being challenged by Wallace at the end.